How to make homemade pizza crust, and enjoy a hearty crust. Pizza dough is easy, and a takes only a little more time than other kinds. I like homemade pizza crust. That means "from scratch," using flour, yeast, salt and a few other ingredients. There are convenience foods for pizza crust. I’ve tried some that come in the freezer case at the grocery store, the box mixes, the refrigerated dough in the tube. I’ve even bought the small pizzas in the deli section, and dressed them up with more toppings. But for the best crust, I keep coming back to homemade pizza dough from scratch. I keep playing around with the recipe, testing different kinds of flour and how much of each ingredient to use.. I like a wheat crust. The flour I’m using now comes from a local mill, stone ground from wheat berries that are organically grown. The rest of the flour is high-gluten bread flour, from another local mill, also using local wheat. Mix the dry ingredients in a large bowl. Then add the water and oil. Mix well. Then knead for about 10 minutes, adding a bit more flour if necessary to make a smooth, satiny bowl that doesn’t stick to your hands or to the bowl. Lightly coat with oil, and put back into the bowl, and cover with a clean dish towel. Let pizza dough rise for an hour in a warm (not hot) place. Stretch crust onto an oiled baking sheet, or prepare for transfer to a pizza stone. 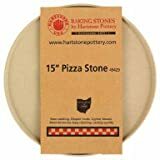 This crust makes about a 14 inch round or 12 by 15 inch rectangular crust. It will be a thin, crispy crust. Add your sauce and toppings. Bake for about 13 minutes. Keep a close eye on the pizza. Cut and serve. When adding the extra flour, err on the side of less flour. If you add too much, your dough won’t come together properly and will be very hard to knead. To make this into a thick crust, add about a half cup more flour, one quarter cup more water, and another half teaspoon yeast. 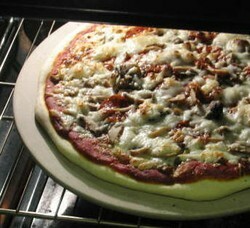 Pizza dough can be left for several hours in a cool place. Or put into the refrigerator to rise overnight. Allow some time for the dough to warm to room temperature before you try to stretch it. Or, if you’re planning a party and will need several pizzas, you can freeze your dough ahead of time. Wrap in balls in single pizza size, wrap well and label. Just allow for thawing a day before you’ll need them. Have You Make Pizza From Scratch? Veronica and Margielynn, I've never used a bread machine, but it seems likely that this recipe would work, just following general bread machine methods, vs. kneading by hand. DerdriuMarriner, probably not. I'm still in love with my canned sauce from Pastorelli. Otherwise, pizza around here is topped simply with some mushrooms and cheese. 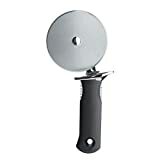 Yes but like Marji I use a bread machine for the dough because of my bad hands. I have had six minor operations on my hands so kneading isn't possible for me. We love pizza! I make my dough in the bread machine because my fingers will not let me do the kneading! There is nothing better than homemade pizza! kimbesa, Will you be sharing recipes for sauce and toppings? If you do, I hope you enjoy it. It is easy to have it hot when you take it from your own oven! I have always had pizza in the restaurant, a take-away or home delivery. 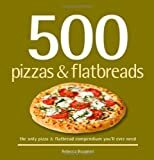 It is interesting to see that there are many who can create pizzas from scratch. Thanks for the tips, maybe I could try it some day. It's always a good time making pizza, we've been doing it since they were tots. Now off to check out your blog!!! You're welcome! I hope they have a wonderful time and fantastic pizza! I love the whole wheat flour recipe. My daughters will have a great time making this, homemade pizza night is a fun filled evening. Thanks.